Since the activity is well built and easy to follow, students could complete the activity/material as homework, and classroom time could be used to discuss the visualizations and material. Lesson is all-inclusive and packaged well. All 9 lessons in this module are included in the CLEAN collection. 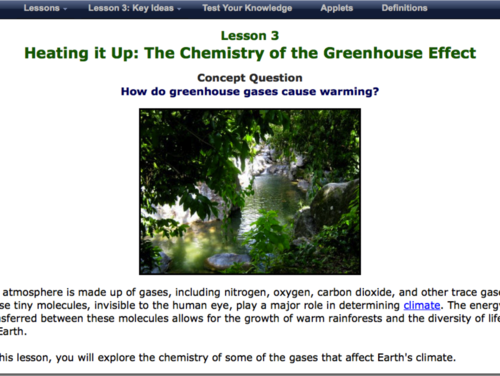 The activity provides excellent explanations and visualizations to learn about the chemistry of greenhouse gases and climate change. No supporting material is provided, but the scientific scope of the activity is well outlined in the activity. The activity provides opportunities for inquiry and experimentation for students while using visualization applets, which provide an excellent tool for students to understand complicated subject matter. Excellent pedagogical organization, beginning with the assessment of students' prior knowledge. Students progress through five key ideas. Vocabulary terms are clickable and defined on the spot. Each key concept provides ample contextual clues, and a review is provided that evaluates students' knowledge via summative assessment questions. The activity is set up very well to guide students through the material. It is technically very easy to use, with good explanations on how to use the applets. Very comprehensive content built directly into the interface of this activity.